< Téléphone 3G et pocket film: l'arrivée quasi-simultanée d'une NTIC et de sa pratique artistique légitime in Les arts moyens aujourd'hui: Tome 1 , L'Harmattan , June 2008. < Les relations entre l'art et la science racontées aux enfants in Sociologie des arts, sociologie des sciences. Symposium proceedings, Toulouse, L'Harmattan, September 2007. < Notes de lecture sur Fred forest et Olga Kisseleva in Utinam n.4. l'analyse des trajectoires : ressources qualitatives et quantitatives, L'Harmattan Nov 2003. Jackson Michael. Through his arranger, Jackson music benefitted of contemporary research. - On his oeuvre and cooperation with Quincy Jones, see [Moorefield] pp. 83-89. - Quoted by [Berger-Lioret] p. 56. > Patchwok Girl (1995) . It is written in Storyspace and published by Eastgate Systems. Commented by [Hayles 2012]. Wikipedia. > The Body (1997). Combination of text and low-fi clickable images. [Greene]. Jacobs Bénédicte. Social media research. Web art. A founder of Larbitslab. Jacobs Henry. Musician, orchestra director. > Vortex Concerts (1957-1960). A series of concerts by Henry Jacobs and Jordan Belson at Morrison Planetarium (San Francisco), a highly technical auditorium at that time, notably affording to turn the sounds around the loudspeakers chain (hence the Vortex name). 4 pages and pictures in [Youngblood]. Jacobs Laure-Anne Jacobs. Media artist. Web art. A founder of Larbitslab. > Tropical fish (1969). Holographic cinema, by Alex Jacobson and Victor Evtuhov. Three pages in [Youngblood], with schema and photography. Jacquard Joseph-Marie. (1752-1834) Wikipedia. 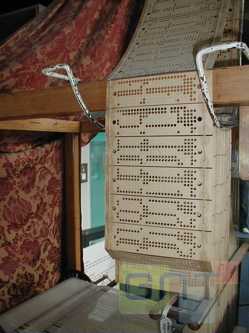 A loom controlled by punched cards. If weaving is an art, then Jacquart and his loom is one of the first digital artists, or at least provider of tools for artists. Jacquemart Christian. Freelance consultant. Annecy professional conference manager. A professor in Computer Science at the University of Paris Sud. His work is focused on interactive 3D graphics and its applications to information visualization, virtual and mixed realities, and visual arts. He is involved in several cooperations on artistic application of interactive graphics (theater, art installations, sound and graphic design...). His current research interests include information visualization (visual analytics), interactive 3D graphics and audio, advanced graphics rendering and applications to arts. He has collaborated with several artists and designers on the realization of augmented reality environments for art installation, theater plays, or multimedia performances. He has published in major conferences in Computational Linguistics, Information Retrieval, Information Visualization, Multimedia, Digital and Performing arts. Since 2012, he is adviser for arts and culture at University Paris-Sud and has created the arts-science CURIOSITas festival in 2013. 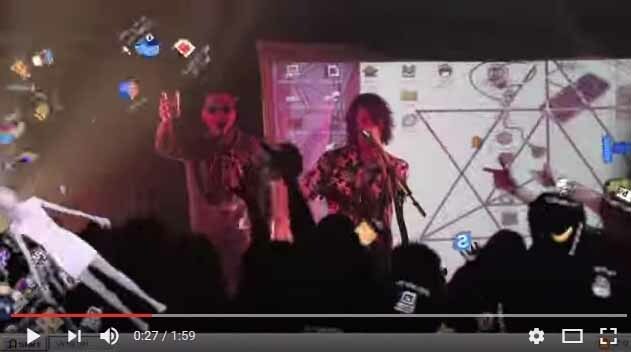 > Virtual choreographer (2010 c.). A 3D graphic engine based on an XML language for interactive spatialized scenes. Using the same purposes as X3D, VC is designed to specify complex geometrical scenes. 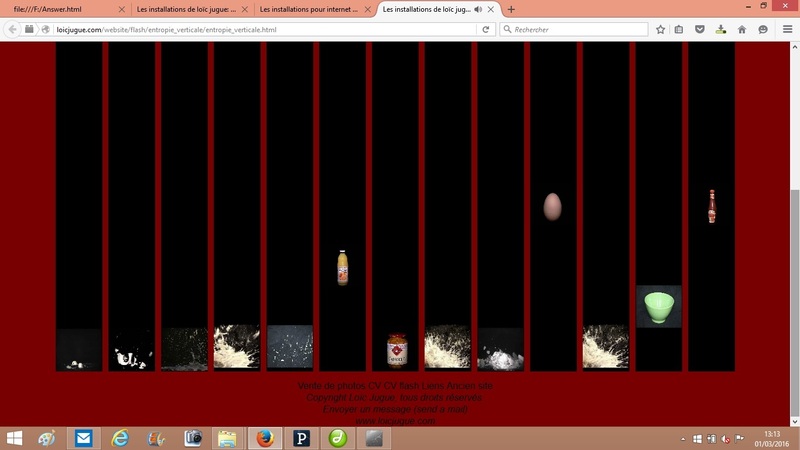 VC focuses on artistic design and multimedia < Simulation technologique et matérialisation artistique. Une exploration transdisciplinaire arts/sciences, by Samuel Bianchini, Nathalie Delprat and Christian Jacquemin. L'Harmatta, Parusn 2012. Jacquet-Droz. The right name is Jaquet-Droz. Jaffray Alex. Music composer and sound designer. Wikipedia. Jaffrennou Pierre-Alain (Do not confuse with Michel Jaffrenou, below). > Propos. A CD with Chronorythmie, Du ciel et de la terre, For Three, Propos. Globally interesting but tiring to be listened to at home. Jaffrenou Michel Video film maker and creator of electronic shows. (Do not confuse with Pierre-Alain Jaffrennou, a musician). Wikipedia. - Quoted by [Couchot 2007] p. 267. A small puppy with complex behavior. > Electronic Video Circus (1984). < Michel Jaffrenou. Le daimon fourbit ses ruses et donne à voir. A article by Louis-José Lestocart. in ArtPress n° 312 (around 2005). Jager Michael. Alias Retrofuture. Animation and games. One page with pictures in [Dermineur]. > zX (2012) A game. Jaist . Japan Advanced Institute of Science and Technology. Jakob + MacFarlane. Architects studio. See archiguide page. - Drawings at Art Paris 2015. > Orange Cube (2010). Quoted by Terracol with pictures. He quotes also Restaurant Georges and Frac Centre d'Orléans as an opposition of continuous Vs. discrete. > Docks de Paris (2007). > Centre Pompidou restaurant (2000). >Tempo (2008). With Marie-Julie Bourgeois. Animation using web cams. [Moulon] p. 74 with a photo. > Animation from keyframes (2004). A work created under Flash with a tablet. CyberArt 2004. < New Media Art, by Mark Tribe and Jana Reena. Taschen 2006. Janicot Christian. Le laboratoire d'images et La fabrique de littérature graphique. Jansen Theo. 12 pages with pictures in [Algora]. > Animaris Umerus (2014 c.) , Animaris Ordis and Animais Adulari. - Artificial life, 3D stereo, and more Wikipedia. Janssens Ann Veronica. Light art. Wikipedia. On GMS website, a catalog of works. > Daylight Blue, Skyblue Medium, Yellow (2011), included in Dynamo: A Century of Light and Movement in Art, 1913-2013 at the Grand Palais (Paris). Not so much digital but near to it. Jaouen Joseph. Sound engineer and computer developer. A member of Omproduct. > Feminine but Elastic (2015), performed by Nicole Pschetz with Joseph Jaouen for computers and music. Japan. See our geographical guide. Jaquet-Droz. Automata maker "Pierre Jaquet-Droz built several automata with his son Henri-Louis Jaquet-Droz (1752-1791) and l'écrivain (6000 parts ), la musicienne (2500 parts) and le dessinateur (2000). - Alain Le Boucher exposed in 2013, hosted in Paris shop for an exposition. - A note about the Jaquet-Droz musician in Les Automates Intelligents. Jarman Mervin. A member of Mongrel group. Jarolim Tomek . Stage designer and "creative coder". Jarre Jean-Michel . Wikipedia (French). Jarrell Michael. Composer. His page in Brahms database. > Confluence (1996). Methodical photography of Earth. Website. Jasso Karla. Chief curator of Laboratorio Arte Alameda (Mexico). < Arte Tecnología y Feminismo, Nuevas Figuraciones Simbólicas Universitad Iberoamericana, 2008. < Core Java, by Cay S. Horstmann & Gary Cornell. Sun Micropress 2008. Jay Jazzy. A pioneer in DJing. and locative media. see [Leloup, 2013] pp. 79 sq. Jean Patrick. Short animation films. > Pixels (2011). Cristal award in Annecy. Philippe Jeantet: Ocean Fishes. Copy art, 1983. Afterwards, Jeanted explored Polaroid copositing, dedicated computers, etc. Jeantet Philippe. An explorer of technologies. > Wall papers (2010). Ink jet prints. > Obélisque des droits de l'homme (1989). 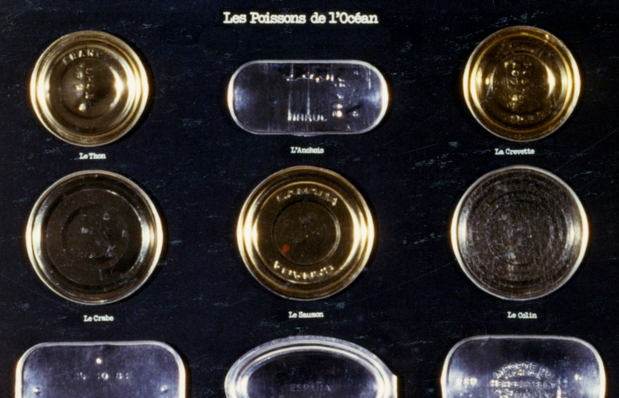 > Les poissons de l'océan (1983). Copy art. Jenik Adriene and Brennels Lisa. > SPECFLIC 2.0. (2006). Comments in [Murray]. > Desktop Theater (1997) [Paul]. Jenkins Henry. Considered the first to use transmedia in its present meaning. See this term. < Spreadable media. Creating value and meaning in a networked culture. by Henry Jenkins, Sam Ford and Joshua Green. New York University Press 2013. < Convergence Culture: Where Old and New Media Collide, by Henry Jenkins. New York University Press 2006. Jenkinson Tom. Aka Squarepusther. Music. Bassist and composer. Wikipedia, from which we take the following data. He started playing in 1994, and has used more and more electronic instruments. Arount 2001 he "started to work with computer based synthesis and signal processing". 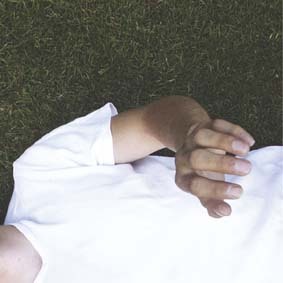 At the end of 2006, he "exhausted his interest in making electronic music". > Music for robots (2013), using the Kawaguchi's Z-Machines. See our post. Jennings Pamela CD-Rom and immersive environment. Relational art. [Popper 2] p. 362. > Shrek (2001). Adaptation of a fairy of William Steig by DreamWorks SKG. Andrew Adamson and Vicky Jenson. Wikipedia. > Urban Space Station (2007 - 2008). by Natalie Jeremijenko and Angel Borrego. 18 pages with pictures in [Algora]. > The Biotech Hobbyist (1998). by Heat Bunting and Natalie Jeremijenko. [Greene], with a screen capture. > Live Wire (1995). [Greene] pp. 70-72 with several photos. - Projet Hermes: "will be an opera made of overheard mobile phone conversations. Small robots will sing the annoying transcribed texts. The project will be financed with the crowd funding tool Startnext." > Handshake (1993), by Joachim Blank, Karl Heinz Jeron, Barbara Aselmeier and Armin Haase. [Greene] p.39-40. > Untitled 4 (before 1977). A picture in the Recode project. < Imaginaire et environnement virtuel. by Jean-Pierre Jessel and Julian Alvarez. in: Dans l'atelier de l'art. Expériences cognitives... Mario Borillo (Eds. ), Champ Vallon 2010. > 1/1 (1999). [Paul] 1999-2001. Presentation of databases on screen. [Greene] p. 140-141. JH Labs. Online tools for grahic creation. - Quoted by [Berger-Lioret] p. 175. > Soma Mapping II (2012) Comment by Edith Russ. Jimenez Jorge. Graphic animation. Since the 1980's. < L'art entre fiction et réalité; by Marc Jimenez (Ed). . L'Harmattan 2014. Works of art considered as fictional devices. < Arts et mutations. Les nouvelles relations esthétiques. Several authors, introduced by Marc Jimenez. Klincksieck 2004. < Qu'est-ce que l'esthétique ? Gallimard 1997. > Matt B Page web. Jobin Gilles. Choreographer. And his Company. > Text to speech (2008). Cited by Frimat (Qu'est-ce que la danse contemporaine). Joconde French museums collections online catalog. Jodi. Group formed by Joan Hemskeerk and Dirk Paesman. The web address jodi.org gives bizarre answers. > Material want (2016C) by Matthew Plummer-Fernandez 3D printed sculptures. - Works of net art in [Lieser] with pictures, and a large one. > Max Pain Cheats Only (2004) A large picture in [Lieser]. > SOD (1999). Game [Paul]. > Untitled Game (1999) A large picture in [Lieser]. > *Yeeha (1996). [Greene] p. 74. > http://wwwwwwwww.jodi.org/ (1995). A web project. Screenshot in [Quaranta 2013] p. 16. and comments. > http://404.jodi.org (1995) . Photos in [Greene] p.6 and substantial comments p.40-42. > OSS/**** (1990 c.) . - [Popper 2] p. 371-374 presents OSS/**** and OSS23 with the comment: "relational and subversive" (with a smile). Jodlowski Pierre. Music composer, with an interest for gesture. - Grainstick (2000 c. ), with the film maker Raphaël Thibault, an immersive installation for the large public. Johanesson Charlotte. Fabric, paintings. Cited in Recode. Johanesson Sture. Painting. Cited in Recode. > Topographic Form (before 1976). Johannsen Kirsten. She works interdisciplinarily with analogue and digital media. > Chaos Temple (1989). [Popper 1] p. 137. Page web. < L'impression numérique. Get quality prints. by H. Johnson. Eyrolles 2003. > Green v2.0 (2002) [Greene] p. 146. < The allure of machinic life. Cybernetics, artificial life and the new AI. by John Johnston. MIT Press 2008. The book is not easy to be read, and calls for a methodical reading more than just a glimpse here and there. But it is really deep, with rare insights for instance on the use of cybernetics by Lacan. - Quoted by [Berger-Lioret] p. 143. Johnston Marklee and Associates. Architects. > Helios House (2007). Service station built for BP conforming to ecological principles, with panels cut by computer. Two pages in [Iwamoto]. Johnston Steven. Writer, mostly popularizer. < Interface Culture: How New Technology Transforms the Way We Create and Communicate . Perseus Books 1997. < Traitement et analyse des images numériques. by Stéphane Bres, Jean-Michel Jolion and Frank Lebourgeois. Hermès Lavoisier 2003. AH No 127 (concepts). Jolivet André. One of the first composers to use Martenot waves (an ancestor of synthesizers), (according to [Collaer]) . Cited by [Baudouin]. Jolly Francis. Photographer, mainly digital. Joint manager of Maison du geste et de l'image. > Ghostcatching (1999). Commented with pictures by [Dixon 2007]. in collaboration with Riverbed. > Gaussian Distribution (before 1977). A picture in the Recode project. Joodan-Kun. Animation films, aka Deviant art. 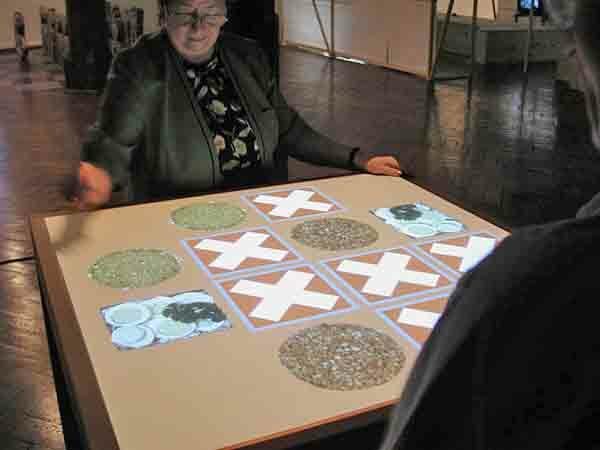 Diverse medias and styles. .
> The reactable (2006 c.) Collective musical composition, .Siggraph 2006. Jouable. Art, game and interactivity. Geneva, Kyoto, Paris. Haute école d'arts appliqués HES Genève, Ensad Paris, Ciren Paris 8, Centre pour l'image contemporaine Saint-Gervais, Genève. 2004. Website : Jouable. Joy Jérôme. Co-leader of the Locus Sonus laboratory. Joyce James. Writer, considered as announcing serialism in literature. > Thema, Omaggio à Joyce (1958). [Ross] p. 612. Joyce Michael. Hypertext writer. Wikipedia. > Afternoon a story (1987). Presented by [Bootz]. > Storyspace (1987), a program by Jay David Bolter and Michael Joyce. See History of Computer Art, by Thomas Dreher. < La culture de l'information, du livre au numérique. AH No 120 (concepts). Judd Donald. Wikipedia. Plastics specialist, theorist, minimalist. Simply shaped tridimensional works. Loïc Jugue : Entropie verticale. > Entropie verticale (2005C). Partly random-generative. video. Julesz Bela. Neuroscientist, perception psychology. Wikipedia. 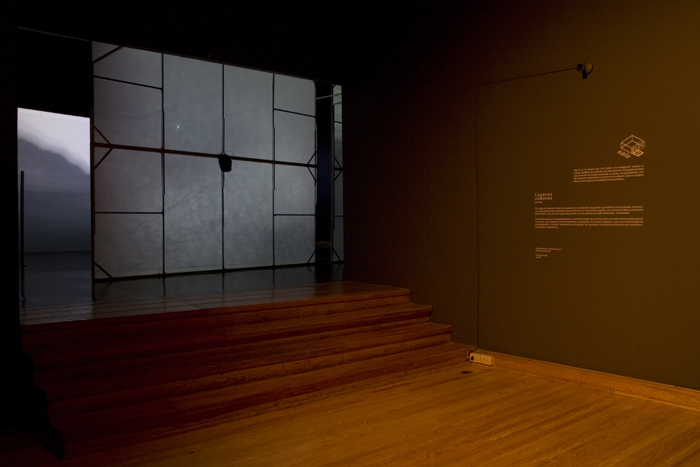 - According to [Greene] , he created images on computer, exposed in galleries during the 1950's. > Learning to Love You More (2002). by Harel Fletcher et Mirandy July. Diffusion of zany instructions on the web. [Greene] . > Jumpin'Jacques Splash ! (1988). Page Paris ACM Siggraph. Jungmann Renaud. Artistic manager, Lisaa Former president of Paris ACM Siggraph. Page Dailymotion. JVRB. Journal of virtual reality and broadcasting.